Free return flights from every mainland state capital are being offered by Cruise Express on two luxury cruise expeditions along the rugged Kimberley coast in April, 2015, with guests booking verandah suites receiving return flights in business class. 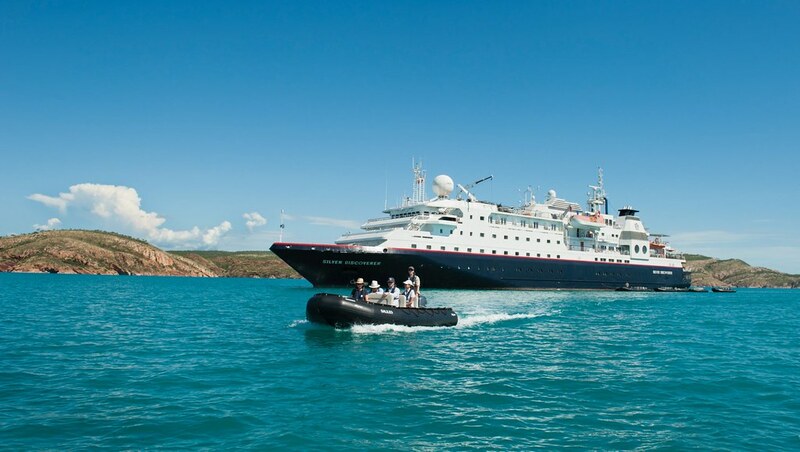 Each of the 10-night voyages between Broome and Darwin are aboard the deluxe Silversea Expeditions ship, Silver Discoverer. Carrying just 120 guests who are pampered by 96 crew, the ship is the only vessel on the Kimberley coast boasting a swimming pool and all cabins are suites with ocean views, butler service, flatscreen TVs and a complimentary mini-bar. Beverages onboard Silver Discoverer are complimentary throughout the ship. The first voyage sails from Broome on April 9, 2015, and traces the Kimberley’s soaring, crimson-coloured cliffs, towards Darwin, with guests boarding the ship’s zodiacs to visit the famous, 100m-high King George Falls and ancient Aboriginal art sites and search for wildlife, including crocodiles. A complimentary flight over the spectacular beehive formations of the Bungle Bungle Ranges is also included in the package. The second voyage from Darwin to Broome on April 19 follows the same itinerary. The package is available from $10,950 per person, twin-share, including complimentary, economy-class flights from Sydney, Brisbane, Melbourne, Adelaide or Perth to Broome and back from Darwin for the first cruise departure or to Darwin and back from Broome for the second departure. Guests booking a verandah suite with its own private balcony from $22,050 per person, twin-share, will receive the return flights in business class, offering a luxury holiday the whole way. For bookings, call Cruise Express on 1300 764 509 or visit www.cruiseexpress.com.au.